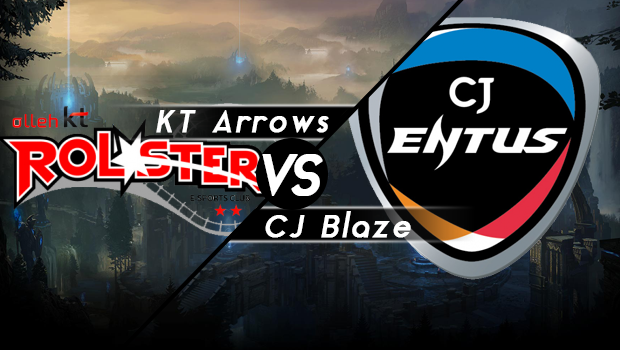 Match 3 of the OGN Spring Quarterfinals featured the up and coming KT Rolster Arrows versus longtime veterans CJ Entus Blaze. This has been a breakout season for the Arrows, and although they have struggled a bit with inconsistency, they have had some remarkable highlights, notably taking down SKT1 K 2-0 earlier this season. Blaze has also been on the rise, showing flashes of a much more aggressive early game to complement their already powerful late game play. All that culminates in what may be the most exciting and unpredictable match of these quarterfinals. From the get go this game looks to be exciting. Blaze is able to pick up Jax, one of the most powerful top lane champions in the current meta. Jax’s strength lies in his ability to use teleport so well, helping him to get through his weak early laning phase and transition into a split-pushing terror, and in the hands of a player as skilled as Flame, there is little doubt the Arrows will have their hands full. On the other hand Arrow is allowed to get his hands on Draven, a champion frequently banned against him because of how devastatingly effective he is. As expected the game starts off brawly. Both sides are able to make some nice early plays, trading kill for kill and objective for objective. Finally at around the 20-minute mark things start to go in Blaze’s favor, securing a very key dragon and transitioning that into a devastating fight over blue buff. Ambition plays the fight perfectly, zoning Draven out with Glitterlance while Jax and Jinx clean up the Arrows, ultimately netting Flame a double-kill in a 3-for-1 trade. Blaze would never let go of their lead after that, creating a devastating split-push with Jax and Lulu that allowed them to nicely cut their way into the base of the Arrows. Finally the Arrows would attempt one last desperate Baron, but a quick response from Blaze would sweep through the Arrows, even getting a Penta-kill on Emperor’s Jinx before Blaze pushed in for the win. Flame wins MVP of game 1 for his crucial early aggression, making great use of teleport to net his team kills across the map. Game 2 of the series started off with a pretty crazy level 1, with both teams actually choosing to invade the top half of the jungle. The ensuing fight will burn a handful of summoner spells on both sides, but everyone manages to escape unscathed. KaKAO will ultimately make the most of the chaos, able to pull off a quick rotation to secure 3 buffs for himself and setting Daydream very far back in the jungle. KaKAO and the Arrows will capitalize heavily on this advantage, applying pressure all of the map and continuously securing advantages for his team. In the midst of it all we see Flame employing an interesting strategy in top lane, getting behind tower to proxy farm very early on, and applying a ton of pressure for the Ssumday and the Arrows to deal with. It was a high-risk strategy that, unfortunately for Blaze, the Arrows manage to respond very well, but a less decisive team would have likely buckled under the pressure. In then end KaKAO’s commanding early lead and the decisive aggression from the KT Arrows will be too much for Blaze, as the Arrows take a brutal 31-4 victory. Ssumday wins MVP of game 2, his great responses to Flame’s aggression really helping to derail the high-risk plays and keep the snowball rolling. Going into game 3, we see a really good start for Blaze. Their bot and top lanes are much stronger early and they are able to predict the swap coming out of the Arrows, forcing the 2v2 and 1v1. Despite DayDream falling behind in the jungle due to a buff steal and an early death, the lanes from Blaze gain a good early advantage, with both Lucian and Renekton gaining a quick CS lead. Ambition’s Nidalee, one of his best champions, is especially impressive. He manages to keep even during the early lane phase, and once level 6 roles around he does a great job pressuring Rookie’s Twisted Fate, preventing him from getting any meaningful Ults off to try and help his team recover. Not all is well for Blaze though, as repeated ganks on the Blaze duo lane, followed by a couple of poor dragon fights, puts the Arrows, and especially Rookie, right back into the game. While Blaze is able to set up a strong siege with Nidalee and Lucian, the Arrows have Twisted Fate, potentially giving them a great way of breaking through the siege. Twisted Fate is very interesting in that his playstyle is very diverse depending on what items you choose to buy first. He can split-push, he can siege, and he can engage very well, but you have to have the right items for the job. Having an early Zhonya’s would allow him to port right into the back line of Blaze and easily engage fights. Rookie instead opts for a build with stronger wave-clear, which potentially costs the Arrows a lot of team fighting power during the mid game. The game goes back and forth for a long time, but ultimately Blaze is able to play out their team comp better, eventually winning in a very tight 18-24 kill game. Ambition wins MVP of game 3. His phenomenal laning really held back Twisted Fate early, and some clutch spears and teamfighting drove the siege home. The Arrows will make some interesting adjustments going into game 4, showing the Caitlyn/Nami lane for the first time this match. Both team comps look to have very similar goals throughout the game, so the impetus lies on the Arrows to use their early pushing power to take a big lead, before the superior scaling of Blaze kicks in. Early on things will indeed go the way of the Arrows, successfully disrupting Blaze’s lane swap and preventing them from setting up a four-man push in top lane. Meanwhile, Caitlyn and Nami are allowed free reign in bot, taking down the tower before quickly rotating to shove down mid as well. The Arrows look to be in a great position, but things start to go awry as they fail to make decisive calls, letting up their early pressure and giving Blaze a window back into the game. While the Arrows are able to eventually take down all the outer towers, some unfortunate misplays will get Blaze right back into the swing of things, and once that advantage is lost the game will get increasingly difficult for the Arrows, as Blaze’s comp will end up doing the same thing but better. They will make Blaze work for it, nearly able to come back into the game with some clutch team fighting, but ultimately a crucial Baron steal from DayDream will help to seal the Arrow’s fates. Blaze ends up taking home game 4 and the match, finishing the game with 13-11 kills. DayDream wins MVP of game 4, crucially stealing away Dragons and Barons to keep a leash on the early power coming out the Arrows. A very hard fought match by both sides, but the veteran status of CJ Blaze really coming through in the end, as they were able to maintain their form and concentration better throughout the match. While the Arrow’s may be done for this season of Champions, they can hold their heads high. As a very young team, they have a lot of room to grow, and fans should expect great things from them in the summer. Meanwhile, Blaze looks forward, as they will face the winner of Najin White Shield versus KT Bullets in the semi-finals; the former having a very strong season thus far and the latter traditionally being a difficult matchup for them. Blaze looks quite promising though, showing they can meet aggression head on, a welcome change for a team known for it’s traditionally predictable play-style. They will certainly have to keep up their strong play if they hope to make it to the Champions Spring finals.